So you want to be a Programmer? Want to learn - How to code, Debug, and Program? The Web is full of free resources that can turn you into a programmer in no time, but never knew Where to start or How to troubleshoot your programs. Learning How to be a good programmer begins with learning logic concepts and language syntax and Google is a superb search engine, used by the majority of users online for finding information. But most of the time we don't get helping hands 'easily & quickly' to debug our programs using Google or other Search engines. Learning to program is hard enough, but debugging is a critical skill, actually - it's frustrating! 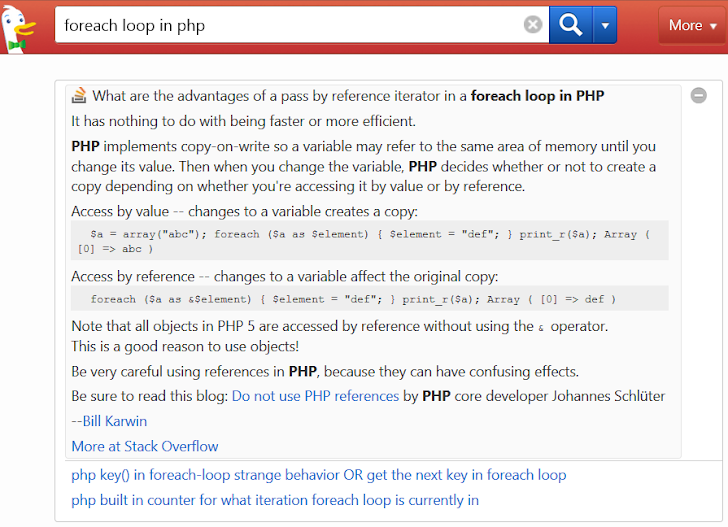 DuckDuckGo, a private Search Engine that claims it gives complete anonymity to its users, has 'Programming Goodies' for you and Software Engineers, i.e. provides a large number of programming tips and solutions from the a number of references, for various programming languages. Following are the few examples, that explains how you can get 'easy & quick' help on 'How to code, Debug, and Program'. Python Codes, Java programming language syntax, PHP, MYSQL and many more.. The Results of Goodies are not stored on DuckDuckGo Search engine's own servers, but it searches the Internet for official documentation of various programming languages or from many crowd-sourced forums eg. 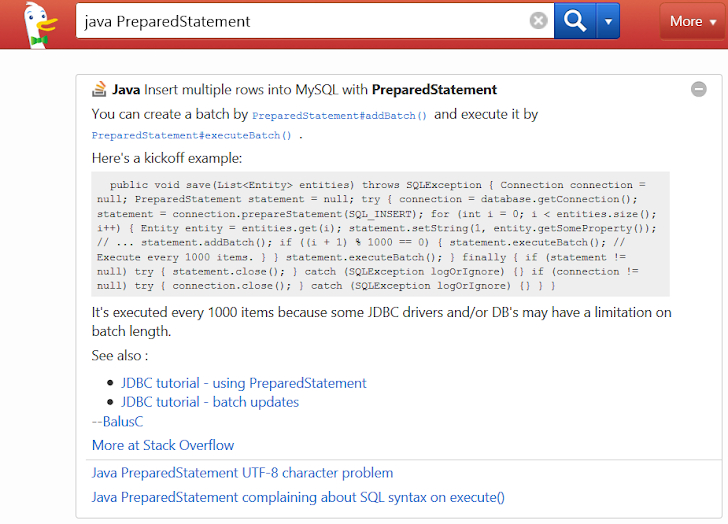 StackOverflow, to display the best possible result for the users. DuckDuckGo Goodies are not only limited to the Software Engineers or Programmers, but also have special tools for 'SysAdmin' and related to Cryptography and Encryption.